birds : The weather continues to batter us. It belts down every day and the wind seems continuously from the South which isn't much use to us. There are plenty of rare and uncommon seabirds in the UK it seems, perhaps when the wind swings at the weekend we may get some benefit. Top marks to my mate John though who only goes and pulls out a Black/White-bellied Storm-Petrel at Severn Beach of all places!! It has been great reading his emails about the excitement of his top find - I just hope he can pin it down to species, but it sounds unlikely. I have been busy with work this week, catching up with stuff I didn't do when I was feeling grotty. Had a Black Redstart at Rousse today and a colour-ringed Pied Wagtail trotted on the playground outside my classroom earlier in the week. As well as a silver ring it appeared to have a single red one on both legs, although I had no bins and I was supposed to be teaching my year 9s about the phases of the Moon at the time! 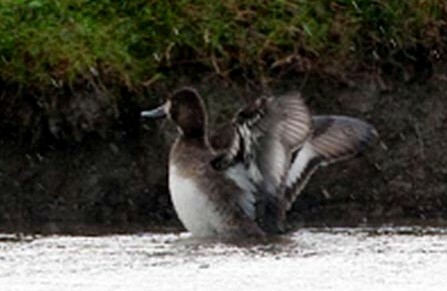 Phil Alexander has taken a very useful shot of one of the Lesser Scaups (which are still there it seems) which shows the underwing pattern very well. Lesser Scaup shows bright white wing-linings (axillaries and lesser and median coverts) which contrast quite a bit with dull greyish flight feathers and greater coverts. And the photo appears to match this pattern - thanks Phil! nonsense : As I said, I've been catching up with work a bit this week so not much time for nonsense. The wild weather sends the kids at school wild as well. 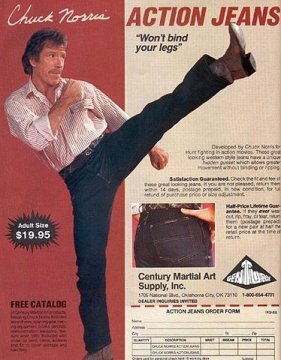 I think in my 'Professional Development' interview my targets will be 1. to invent a time machine so that I actually have enough time to do my job properly, 2. to have cosmetic surgery to remove the black rings under my eyes and 3. to lobby for the new school uniform to include Chuck Norris "Action Jeans" because they look chuffin' awesome! !